The Grasonville Volunteer Fire Department is comprised of Two separate buildings in Queen Anne's County Maryland on the Eastern Shore. It is one of 9 totally volunteer fire departments in the county. Station 2 (The Original Firehouse) is located at 4128 Main Street in the heart of Grasonville. It is a one story traditional brick firehouse with three drive through bays and one single bay. It also has a spacious hall and kitchen area, a day room, a radio room, and several offices. Our Second Building is located next door to the Original Firehouse at 4132 Main Street. Originally built as a seperate EMS Station, now holds both BLS Ambulance's and our utility truck. This building also contains living quarters and additional offices. Station 2 buildings are located 10 minutes from the Chesapeake Bay Bridge just off of Route 50. The department has the second smallest first due response area in Queen Anne's County but we respond for mutual aid on first alarms to four separate jurisdictions within the county. We also routinely respond mutual aid to Anne Arundel County. The station 2 first due response area is comprised of rural area's, residential neighborhoods, business districts, as while as light commercial area's and miles of watershed from the Chesapeake bay. The department currently responds with one class A 750 gallon/1250 GPM rescue/engine, one 105 Ft Quint, one class A 1000 gallon/1250 GPM pumper, one 2500 gallon Engine-Tanker, one Heavy Rescue, one 250 gallon/GPM brush truck, one fire boat, one utility truck, one Command Vehicle, and Two BLS Ambulances. The department normally responds to 500 to 700 fire and rescue calls and 600 to 800 EMS calls each year which makes us the second busiest company in the county. The department is made up of approximately 90 volunteers. These volunteers vary from our junior members (under age 16) to charter members who are in there 80's. The department is an energetic department with the youngest and most active membership in the county. 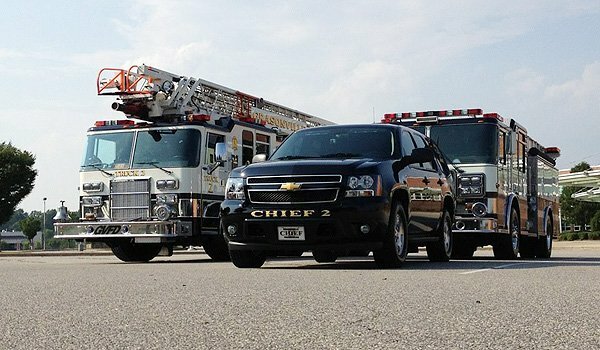 The Grasonville Volunteer Fire Department prides itself on dedicated service to the residents of Grasonville and Queen Anne's County. This service is accomplished by the most aggressive interior firefighting and search and rescue operations in the county. The true dedication of the members is evident by the relentless hours of vigorous training, countless hours of fund raising, and in-station/on call standby response readiness. The department is always interested in new members. If you are interested please read the Recruitment page on this site and you can either stop by or call the station at 410-827-8100.